For example, the constant hammering that a proper release is somehow “flipping” or “scooping,” which are very fundamentally different things from a proper release. On the one hand, you have Modern Golf Swing players jumping out of their shoes trying to generate club head speed, and incurring all sorts of injuries in the effort, yet at the same time, Modern convention has them all interfering with club head speed with their mechanics! I would agree in full, to be honest – the whole idea of throwing or swinging with speed and power is that the wrist action adds to the arm motion, increasing the speed over an action where the wrist remains frozen. So, ask yourself how fast you’d be able to get that club head going if you swung and kept your wrists absolutely frozen. Now, take it one step further and ask yourself why on earth you would try to interfere with the natural pendulum or hinge action of the wrists and club shaft coming through impact? Well, if you would answer that you don’t do that but you also think a natural release is “flipping,” then you’re contradicting yourself. In that regard, if you think you’re adding any power by coming through impact with a stiff “bowed” wrist with the leading arm, then you’re doing the opposite. A “flip” or “scoop” action, to clarify, is one where the body is slowing or not turning the way it should, leading to an early release of the wrists and club, and in which the club head passes the hands before the swing bottom. 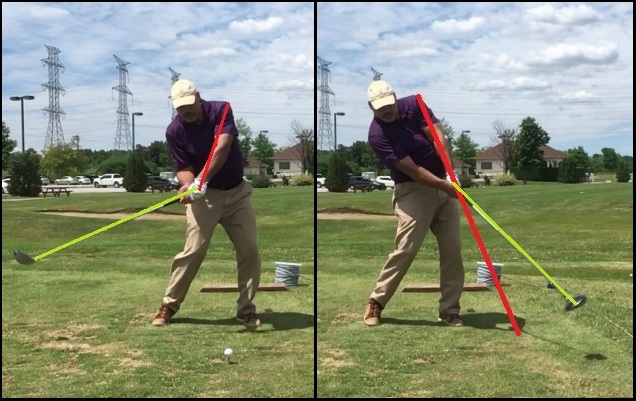 Looking at the two pics above, pre-and-post-impact, if you are going to try to keep that angle in the leading arm and shaft through impact, then you are slowing the club head down. Simple – the green shafted club head in Frame 2 would have traveled a greater distance in the same time from the position in Frame 1, and the only way it could do so is if the red-shafted club had slowed down or decreased acceleration into the bottom. Otherwise, they’d be in the same position post-impact! The leading arm does not stop at impact, it keeps swinging forward, but if you are trying to keep the straight angle between it and the shaft, you can only do that by slowing the club head down through the swing bottom. You see how the right wrist extends through the “3 To 9” phase of the swing bottom? Well, you simply can not extend the right wrist if you try to maintain the angle between the leading arm and shaft – in other words, you can’t keep a bowed leading wrist through the impact zone and beyond and still extend the trailing wrist! You simply can’t straighten the right wrist if you’re keeping the left one bowed. So, the only way to naturally release the club is to allow both wrists to work in unison – so if you do anything to one wrist action, you are doing the same to the other. And now you will likely agree that you can’t create maximum speed with your swing if you impede or slow the wrist action down. The club head should and will naturally pass the hands at the swing bottom as surely as a natural pendulum action will have the “hammer” end passing the fulcrum (the hands in the 3rd Lever action) at the swing bottom. Anything less, and you are decreasing the maximum speed of your club head through impact. The only difference is that in the swing, the leading arm continues to swing past vertical and the hands also continue to move, but the pendulum effect should still be there. All that effort there, you can almost see Jordan Spieth trying to keep a bowed leading wrist while still trying to release the right wrist and hand – you can’t stop one wrist action and keep the other one going, and that’s simple science. So, if you’re swinging and being told you’re “flipping” through impact just because you’re not holding the leading wrist angle through impact, then you know that your instructor doesn’t know the first thing about dual wrist action or biomechanics. If your club head is passing the hands before the swing bottom, then you know you’re flipping or casting, and that’s because you aren’t using a weight shift and pivot to swing down and through. Also, if you’re experiencing a “chicken-swing” type of release, it’s also because the body is slowing down through the swing bottom. But if you’re shifting as you should be from the trailing to the leading foot and swinging down naturally with a free release, then you will pass the hands with the club head at the swing bottom, and that’s exactly what should be happening. I’ve been holding off the release for some reason or another. It’s been a pain to fix. 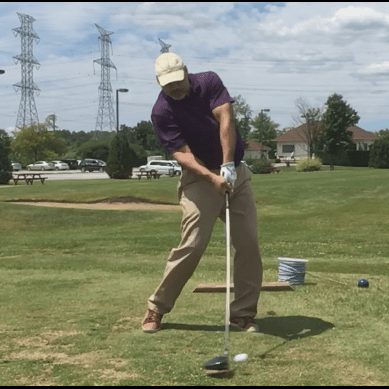 I guess the key is to allow the clubhead to swing freely without holding anything back. 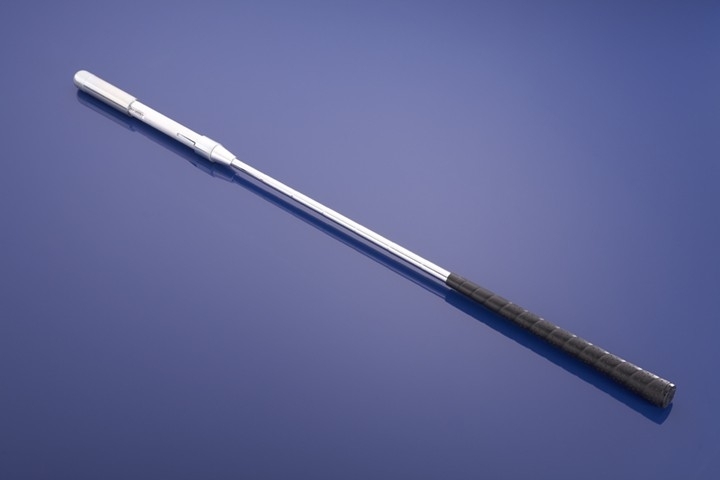 Forward shaft lean is important (for irons), but you don’t get it through manipulation. It’s the swing bottom in relation to the ball position. Will go outside for a few and work on allowing the clubhead to release better. Might take a couple weeks to get used to.